Maltese Sweet Treats (Caffe Cordina) | Simple. Tasty. Good. What are you thinking of if you hear the words ‘mediterranean’ desserts? What goes through your mind? Things like ‘healthy’, ‘light’, with lots of fresh fruits and dairy products? Read more about Maltese sweet treats here! I prepared a mediterranean stye dinner at home a couple of weeks ago and served for dessert fresh Greek yogurt with sliced blood oranges, freshly chopped cilantro, pistachio nuts and drizzled the whole shebang with some Greek thyme honey. That’s what I would expect for a med dessert. Or how about my orange carpaccio with (again) fresh coriander and pepper? Good try but it’s slightly different in reality. 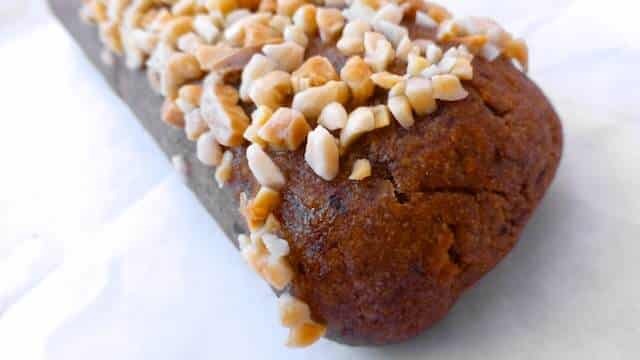 Keywords here: pastry (preferably fried), ricotta cheese, honey, (dried) nuts, treacle, vanilla, dried fruits… I guess you got it: pretty sugary and heavy stuff this is! Best place to sample these treats in Malta accompanied by a good cup of coffee? 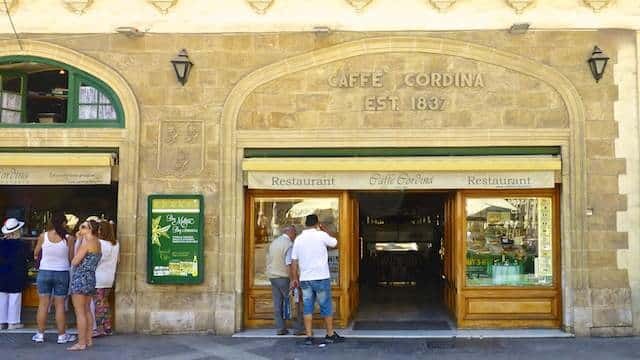 If you ask me: at Caffe Cordina in Valletta, a must if you visit this island’s capital. Not only the food is worth a break but the interior also needs to been seen. Notice the winding staircase on the left, the decorated ceilings and the old-fashioned bar! All this and the sticky treats behind the counter made me somehow think of the Portuguese pastéis de Belém shop in Lisboa. There’s room inside for a cup of coffee with some sweets if the weather isn’t all that great but if you can, find yourself a place outside on the huge terrace. The menu offers not only desserts but also pasta dishes, smoothies, ice creams, some sandwiches, a couple of local Maltese specialties and so on if you fancy a light lunch of dinner. Prices are not sky high for a popular tourist spot like this one but surprisingly reasonable. As we sat down and enjoyed the buzz around us we watched some plates people around us had ordered: all of them looked very appetizing, portions were quite large as well. 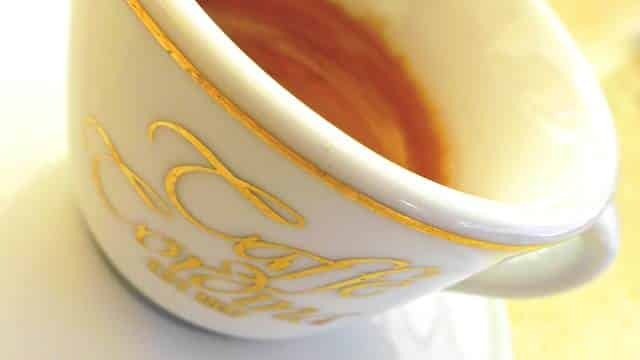 But since we had just enjoyed a great lunch at restaurant D’Office around the corner, we only ordered an espresso (€1,30). An excellent one, by the way! No Maltese sweet treats then? Oh yes, of course! We bought some afterwards to take home with us. 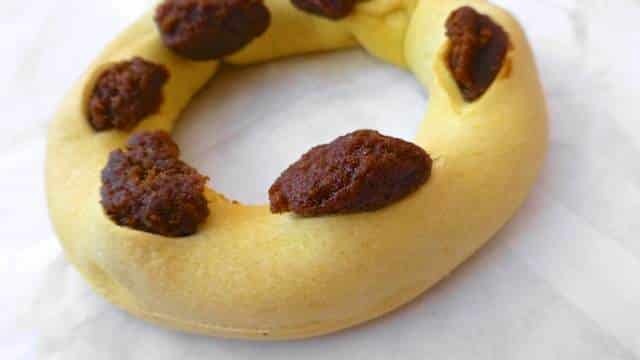 Gagħaq ta’ l-għasel or a honey ring: a pastry circle with a treacle and tangerine filling. This is a popular treat around Christmas but honey rings are available the whole year through. Another treat we bought was quarezimal, also known as almond biscuits but this one was shaped into a bigger log. Looked and tasted pretty much like gingerbread! This one is traditionally served during Lent. Both seemed like enough for just the 2 of us. But there’s much more to find here at Caffe Cordina! Other specialties such as Maltese bread pudding, nougat, helwa and kannoli are on sale alongside fruit tarts, cupcakes and panettone. Let’s save those for next time. Other sweeties you will probably encounter here in Malta: figolli (Easter cookies in various symbolic shapes, glazed and stuffed with almonds), sinizza (puff pastry filled with ricotta and confit orange zest) and prinjolata (a sponge cake covered in white glaze, chocolate and candied peels, popular around carnival).